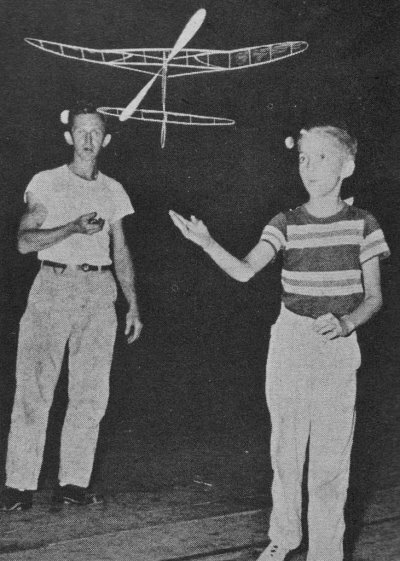 10-year-old Stephen Stackhouse, of Levittown, Pennsylvania, then chances are if you recognize anyone from these 1957 Nats pictures, it is your father or grandfather. 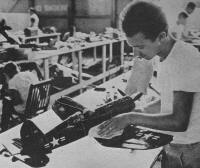 I think I saw that pinstriped sport jacket of Frank Bropher's hanging in the local Salvation Army thrift store ;-) The Corsair control line model was make from the same type kit as my Sterling F4U Corsair (which is still under construction). 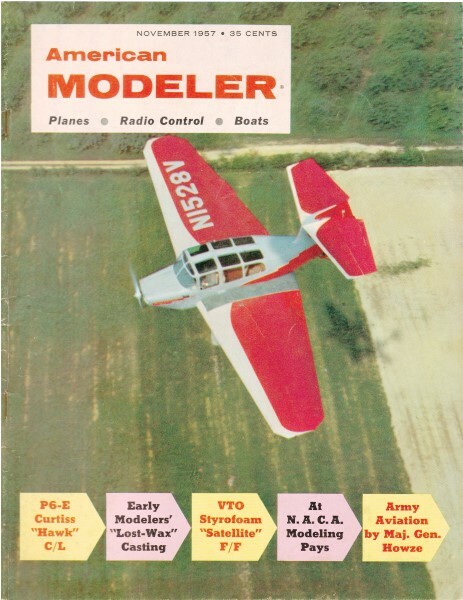 Whether your interest is speed or duration, scale or original, free flight or control line, "indoors" or out, radio control or rise-off-water, there was plenty to keep you busy at the 26th running of America's model plane championships, the annual Nationals (or ''Nats''). 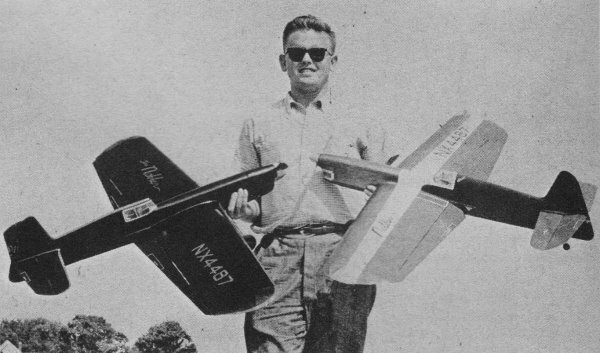 The skies above Willow Grove, Pennsylvania, were alive with models; the concrete runways of the Naval Air Station were covered with control line flyers, radio experts and free flighters by the hundreds. Now that you've met the new champs (on page 4) we want to show you some other contestants and their interesting craft. Starting upper left and working our way around counter-clockwise we find first Don Mackenzie from Montreal, top man in the Wakefield flying. 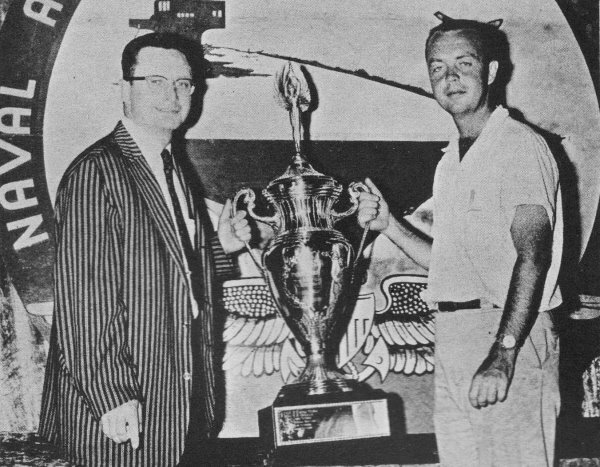 Don's total time of 17 minutes, 54.2 seconds was 80 seconds better than the next highest entrant, Dan Sobala of Massachusetts. Projected span on Don's Wakefield was 44", length was 38 1/2", power was 12 strands of 1/4 x 1/24 Pirelli rubber with 900 turns. Accepting the Testor "Best Finish" award is Joseph Coles, Mt. Holly, New Jersey. 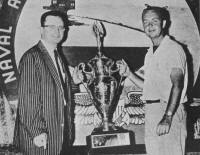 Making the presentation is Frank "Stripes" Brophy of Testor's. In control line scale Joe placed fifth in the open age class. 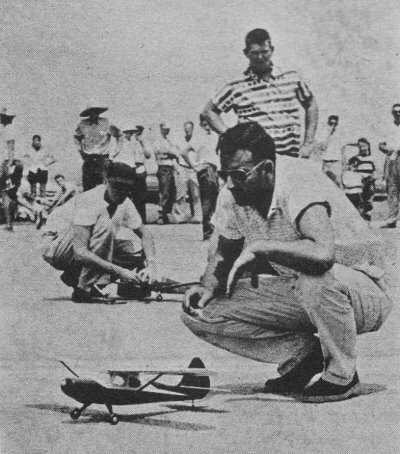 High time in unlimited class for rubber powered models was hung up by Robert Hatschek of Douglaston, New York, with a total of 13 minutes, 13 seconds. Nearest contender was California's Joe Bilgri who had 8 seconds less. Contemplative take-off is that by Dan Lutz in the free flight scale contest. 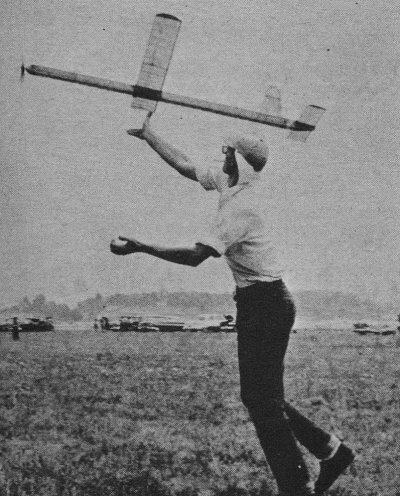 His Aeronca Sedan used a Sky Fury. engine. Dan's from Hawthorne, California. Wide-eyed launch by Stephen Stackhouse, 10, of Levittown, Pennsylvania, ended as a "first" in Junior age class indoor microfilm-covered stick model flying. Steve's time was 12 minutes, 8.8 seconds. He also placed 4th in indoor cabin and 2nd in indoor paper-covered stick. Quite a performer! 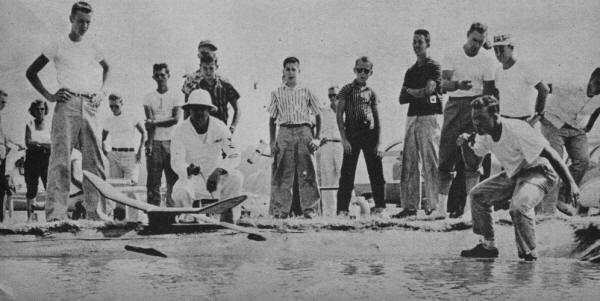 Best man in off-the-water competition, Robert Kleinfelder, Hamilton, Ohio, is seen launching his K&B .15-powered Comet Zipper. His total time of 12 minutes is a new national record. 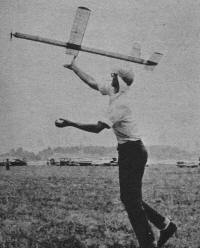 Repeating a previous national victory, George Aldrich of Tyler, Texas, won top stunt honors with a score of 618 points. 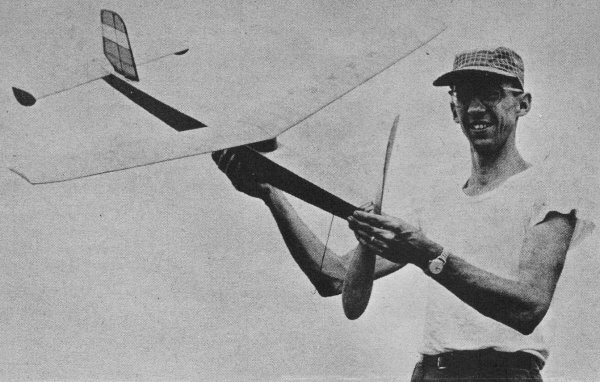 He's shown holding two Noblers; he flew the dark one which was powered by a Fox .35, weighed 46 oz., had 30 coats of dope over paper. Polishing up his Vought Corsair is Michael Burke from Louisville, Kentucky. 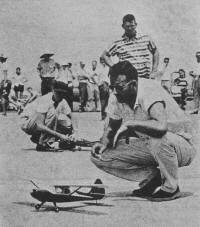 Mike was first in senior control line scale with this K&B .29-powered plane built from a Sterling kit.